CULLMAN – On Friday evening, as the work week was winding down, the Warehouse District was cranking up for the third annual installment of “2nd Fridays.” The series is a collaborative effort between the Cullman Area Chamber of Commerce (CoC) and Cullman Parks, Recreation, and Sports Tourism (CP&R), bringing together downtown merchants, the Festhalle Farmers’ Market, entertainers, car collectors and others on the second Friday of each month from June through September for a lively street party. Along First Avenue through the Warehouse District, businesses stay open late, a classic and custom car show draws the gearheads, farmers sell their produce at the Festhalle, and crafters and artists set up shop in “Artists’ Alley.” If folks get hungry, there are choices from eateries and food trucks/trailers up and down the street; performers play live music at various locations around the district. The Tribune caught up with CP&R Executive Director Nathan Anderson at the kid zone behind the Festhalle, where children made chalk art and played on inflatables. Maybe the youngest business owner at this year’s event was Lindsey Lowery, a student (not a graduate, a student!) at Cullman High School who won a free booth at this year’s 2nd Fridays in a competition sponsored by the Chamber’s Young Entrepreneurs’ Academy (YEA!). (See www.cullmantribune.com/articles/2018/04/06/cullman-area-students-step-shark-tank-kickstart-their-own-businesses. 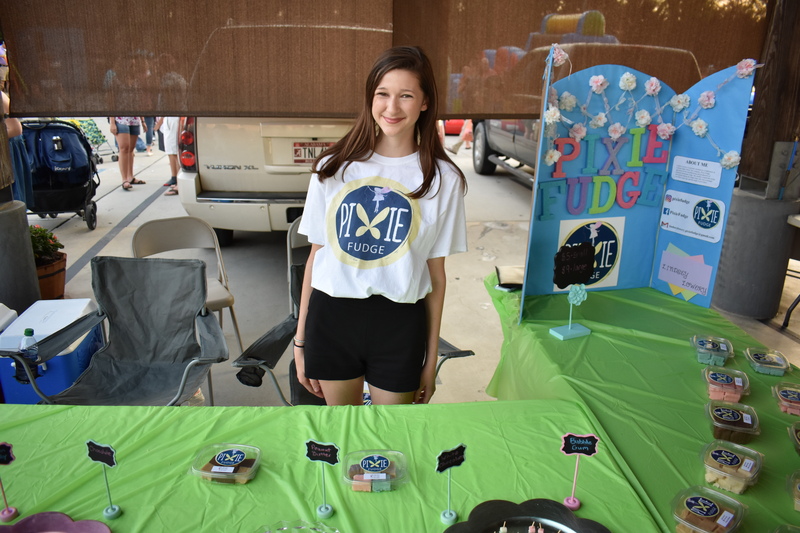 Her business, “Pixie Fudge,” is based on a family recipe and features unique fudge flavors like cotton candy and bubble gum, in addition to classics like chocolate and peanut butter. Since the “Shark Tank” style competition, Lowery shared with The Tribune, “It’s been really good: like I’ve been updating the website and I’m going to almost get that up when school starts back. 2nd Fridays will return to downtown Cullman on Friday, July 13, from 5-10 p.m.